They transferred 201 detainees, but the president didn’t keep his promise to shut down Guantanamo. The prison camp on the island of Cuba had come to symbolize the abuses of the war on terror. Shutting it down was supposed to be easy. The Bush administration had already begun the process. But eight years of partisan battles, bureaucratic infighting and a last-ditch effort later, the facility that Obama once labeled a “blot on our national honor” remains open. No one is more acutely aware of that failure than the men Obama chose to lead his effort to shutter the camp. They can point to some successes in their mission. About 780 men and boys were incarcerated at Gitmo at one point or another. Exactly 242 remained when Obama took office and today just 41 men are imprisoned there. Yet it’s likely those men will stay at Gitmo for the rest of their lives. Looking back, the “Guantanamo czars” say the administration made key mistakes by badly misjudging the mood of Congress, agreeing to use military tribunals and not moving fast enough to close the prison from the very start. To members of the Obama administration, the Guantanamo prison camp, which President George W. Bush had opened in 2002 to house the so-called masterminds behind the 9/11 attacks, always felt like an inherited burden. “In the Bush administration, there were a lot of decisions made in haste and in the emotion of the moment that turned out not to be wise, and Guantanamo was one of them,” said Daniel Fried, a career diplomat who served as a special assistant to Bush and became Obama’s first special envoy for Guantanamo closure. By the end of the Bush administration, Fried said, hundreds of detainees had already being transferred elsewhere, and White House officials wanted to close the prison. Fried recalled a Bush official muttering that if all of the detainees were released, the damage they might do would be less than damage the existence of Guantanamo itself did to the U.S. effort to fight terrorists around the world. When Obama took office in 2009, his goal was to send as many of the 242 remaining prisoners back to their own countries as possible. For those who couldn’t go home due to prolonged instability or fear of religious persecution, he would find other nations willing to take them. Those not yet cleared for release would be held in federal prisons. A smaller group accused of crimes against the U.S. would be housed in federal prisons and tried in federal courts. Closing the camp had drawn support from prominent Republican voices on foreign policy, including Sen. John McCain (R-Ariz.), who had just lost the presidential race to Obama. “It did not seem to be highly contentious and I think it would be fair to say that in the early days of the transition we thought this would take place in the ordinary course of business,” said Greg Craig, Obama’s first White House counsel, who drafted the executive order to close Guantanamo. Still, nobody in the administration was immediately assigned the job. It was a mistake. With no one officially focused on Gitmo closure, no one was watching for any red flags in Congress. One day, Craig received a warning. Sen. Dianne Feinstein (D-Calif.) called and told him that Congress was tacking language onto a funding bill that would ban the administration from moving any Guantanamo detainees to the U.S.
Craig felt unsure of what to do. The legislative fight wasn’t in his job description. “I said, ‘That’s something that the congressional liaison people are handling. I’ll make sure that they are on top of it,’” he recalled. Now he sees that moment as a turning point. “The fact that suddenly the Republicans were seeking to put conditions on the closure of Guantanamo, and the fact that in the administration we weren’t fighting back or weren’t reacting to defend our freedom to close it, was a warning shot, in retrospect,” Craig said. As that bill was being readied, the Obama White House was working on its first detainee transfers — the last 17 Uighurs left at Gitmo. The Uighurs were Chinese Muslims who had traveled to Afghanistan in the 1990s to flee persecution at home. They would face further persecution if sent back to China. But keeping them at Guantanamo was also wrong: They had been handed over to the U.S. after the Afghanistan invasion in exchange for bounty, and they had no connection to 9/11 or the Iraq War. Obama administration officials decided to resettle the Uighurs in the United States. The first few would be released in Northern Virginia, where there was an existing Uighur community. But in early May 2009, after the media reported the administration’s plans, Rep. Frank Wolf (R-Va.) gave an impassioned speech on the House floor saying he didn’t want “terrorists” in his district. Congress soon passed a measure effectively preventing U.S. resettlement of the detainees — the same measure Feinstein had warned Craig about. Half a year after taking office, the Obama administration had lost the first Gitmo battle. The administration backed off. “I would say that the more intense the controversy grew, the less willing we were to engage in that fight,” Craig said. Craig’s own tenure as White House counsel lasted less than a year. He left the administration in January 2010. News accounts claimed he was pushed out in part because he couldn’t get the ball rolling fast enough on Guantanamo. “We were losing 700,000 jobs a month, we were trying to put together a bipartisan coalition to support a national health insurance program, and there were only so many fights that could be conducted at the same time,” said Craig, now of counsel at the law firm Skadden, Arps, Slate, Meagher & Flom. As the Uighurs’ fate was being debated, the White House finally picked someone to focus full-time on shutting down the prison camp: Fried. The newly appointed Guantanamo czar had worked in the Foreign Service since the late 1970s, under Democratic and Republican presidents. He sees the political process as often unnecessarily partisan and warns people to “watch out for decisions taken in the heat of the moment,” paraphrasing one of his idols, Irish political philosopher Edmund Burke. But Fried soon found himself constrained by Republican lawmakers determined to stop the administration from moving Guantanamo detainees anywhere for any purpose. By the time Fried was considering which detainees to try in federal court, Republican lawmakers were moving full speed to stop that, too. The congressional measure that prevented the Uighurs from being resettled in the U.S. also restricted the use of federal funds to transfer prisoners from Gitmo to U.S. soil for the purposes of prosecution. To Fried, it was clearly politics at play. He had seen how earnestly Bush staffers sought to close the prison with no pushback from the Republicans — and no support from Democrats. Now he was witnessing a 180-degree reversal. Blocked from using federal courts to try Gitmo detainees, Fried and the White House were left with one option for legal proceedings: military tribunals. Guantanamo’s military tribunal system had been established under a Bush executive order, struck down by the Supreme Court in 2006 and quickly re-established by Congress the same year. Several detainees had been charged during Bush’s tenure, but less than a handful had been judged and sentenced. The system had a history of delays. Obama decided to meet Republicans in the middle. By reforming and using the tribunals, Craig said, the president aimed to show that he could pursue bipartisan solutions on national security issues. Today, that effort to play ball with Republicans at a time when many of them were actively attempting to tighten the reins on the executive branch seems idealistic at best. To several of the former Gitmo czars, Obama’s decision to go ahead with the military tribunals was the kiss of death for Guantanamo closure. “As long as the military tribunal process was going, it would be very hard to close Guantanamo because that was the location of the military tribunal,” Craig said. Only 30 detainees would be formally charged under the military tribunals during the Obama presidency, and a mere eight would make it through trial to conviction. Part of the problem was that the tribunals were “untested institutions,” Fried said, without the well-established rules and procedures of the federal court system. Seeing his fellow lawmakers’ disdain for the prisoners, Moran, the Virginia congressman pushing to close the prison, began to lose hope that the Guantanamo situation could be fixed at all. Fried labored for over three years as the Gitmo czar, transferring 70 detainees in total. (The administration also moved out a handful before he came on board.) His efforts kept hitting roadblocks, including when Democrats lost control of the House of Representatives in 2010. But it was the passage of the National Defense Authorization Act of 2011, which required that any country willing to accept a Guantanamo detainee must first guarantee that the released man would never again engage in terrorism activity, that ultimately “exhausted all of the political capital,” Fried said. In January 2013, at the beginning of Obama’s second term, Fried was reassigned. For several months, the president chose not to appoint a new special envoy for Guantanamo closure. But Obama hadn’t given up yet. In May of that year, speaking at the National Defense University, he recommitted his administration to closing Guantanamo, then under renewed public scrutiny because multiple detainees had gone on hunger strikes. The timing was important on another level as well: The president was thinking about his legacy. In July 2013, Obama appointed lawyer Clifford Sloan as the new special envoy on the advice of Secretary of State John Kerry, who knew him personally. Sloan was a partner at the Skadden law firm (Craig knew and approved of him, too) who had once served in President Bill Clinton’s White House. At the time Sloan took the helm, there were 166 prisoners left at Guantanamo and more than half of them had been approved for transfer. But Sloan hoped that the passage of time might have eased some fears in Congress. He even came close to persuading the Senate to pass a bill allowing the administration to transfer some detainees to the U.S. That language was ultimately stripped from the legislation. Sloan did manage to get language passed that made it easier to send detainees to third countries that were willing to monitor them. He also set up a periodic review board to speed up the process of determining which prisoners could be released. And during his 16 months on the job, he transferred 39 prisoners to other countries and set the path for release of 11 more. Sloan also faced some unexpected hurdles within the Obama administration. “There was a period where there were a number of transfers that were completely ready to go and there was a period of unnecessary delay,” he said. According to media reports at the time, Defense Secretary Chuck Hagel was dragging his feet on releasing the detainees because he was concerned they would kill Americans once released. Although Hagel announced his resignation in November 2014, Sloan, frustrated by continued delays, departed a month later. Lee Wolosky led the Obama administration’s final push to empty the Gitmo detention facility. Another lawyer, he had worked at the National Security Council under Bill Clinton and George W. Bush. Since July 2015, Wolosky has moved 75 detainees from Guantanamo, getting the count down to 41. A final four were just transferred on the eve of Donald Trump’s inauguration, Foreign Policy reported Thursday. The remaining prisoners will become President Trump’s problem, as will the decision whether to continue the effort to empty Guantanamo. So far, Trump has indicated he wants to keep the camp open and even increase the number of prisoners — to “load it up with some bad dudes,” he said, potentially by bringing in people with ties to the Islamic State. He has also said he would be “fine” with sending Americans accused of terrorism to Guantanamo. 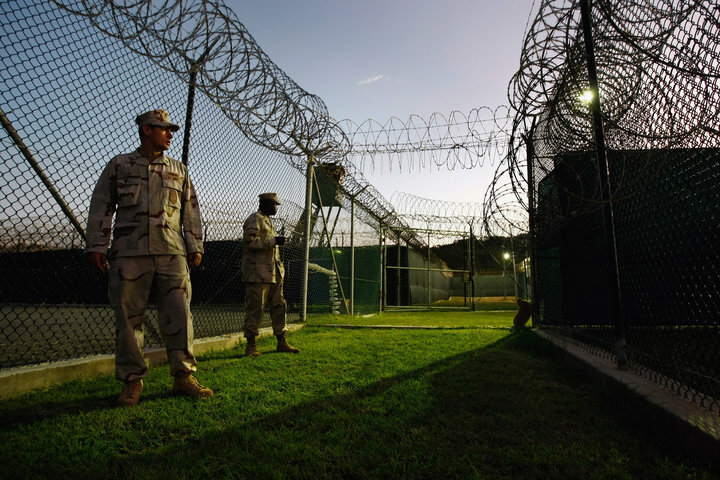 The men Obama asked to shutter Guantanamo have mixed feelings about their legacies. But Moran, the congressman who wanted to close the camp, refuses to express any glass-half-full optimism.